The DA has a plan for the NCOP, but do the numbers add up? There are days in politics when I feel like the now famous Marelize's mother after her daughter rode into the rugby posts. Last week when the ANC released their list of candidates for the National Assembly was one of those days. Seeing the top 100 names on the national list I, like many others, threw my hands in the air with exasperation. How is it possible that so many that have been implicated in corruption and state capture are not only on the list, but in the top 100? Is this really the best the governing party can come up with? ANC secretary general Ace Magashule defensively told the press that no one on the list had done anything wrong so he could not understand why they could not be on the list. He is technically correct. Constitutionally any South African citizen above the age of 18 who has not been declared insolvent may become a Member of Parliament. As long as they have not had a criminal conviction after 1996 which resulted in a jail sentence of 12 months or more and without the option of a fine, they can be nominated by the party. So yes, no one on the ANC list has been found guilty and given a sentence of 12 months or more without a fine. Not yet anyway, but that is of course not the point. The ANC wants us to believe that it is a new ANC, or at least the ANC of the Freedom Charter and Mandela. The central message from the president is that there is a new sheriff in town who will not tolerate any corruption. The problem is that this is starting to sound pretty hollow with so many of those implicated in the very shady business of the Zuma years on the list, particularly in the top 100. The question is, of course, why was this tolerated by Ramaphosa? The answer lies in the nature of the ANC's nomination processes. Unlike the DA, which has a top down approach, the ANC's list process is very much bottom-up. According to the ANC's guidelines, every branch has to nominate 40 candidates for the national list. 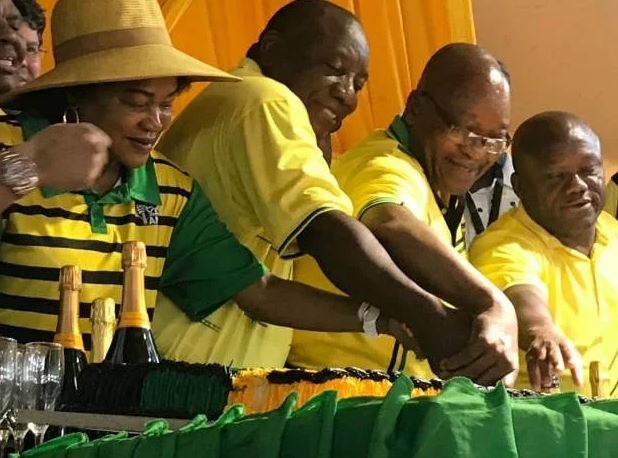 In practice this means that after they have nominated individuals linked to the specific branch, region, and province, ANC members often resort to nominating names purely because they are familiar with them – and not necessary for the right reasons. These names are then submitted to a national list committee and voted on at a national list conference. It is ANC policy that the top 25% (or 50 places) of the national list stands as per the popular vote. This is very much a case of democracy not always securing the right outcome. Having said that, it seems that the ANC did not abide by their own criteria as per the 2018 National List Guidelines document. Under the heading of "Criteria for Candidates and Lists" it is stated that, apart from the constitutional requirements, candidates must have "no history of ill-discipline or corruption" and "no history of involvement in fostering divisions and conflict". So how on earth did so many of those names make it onto the list? The fact that questionable individuals made it back onto the list is not the only lost opportunity for the ANC. There are also many capable MPs who will not come back since they are either not on the list or ranked too low. I'm sure Des van Rooyen won't be missed, but people such as Joan-Marie Fubbs (chair of the Portfolio Committee on Trade and Industry) and Yunus Carrim (chair of the Standing Committee on Finance), both extremely capable, experienced, principled parliamentarians and struggle stalwarts, will be a great loss to Parliament. There are many others like them. Current Cabinet ministers such as Ebrahim Patel and Michael Masutha are also too low on the list to retain their seats. Interestingly, 13 out of the current 36 deputy ministers did not make it back onto the lists at all. Having gone through the list extensively, it struck me how many 2014 Cabinet members appointed by Jacob Zuma were still there. On closer inspection it turns out that two had passed away and three had retired. Of the rest only three did not make it back onto the list. That means that 27 out of the 35 ministers of the 2014 Zuma Cabinet are back on the list. That is very worrying to me. However, even more shocking is the fact that 25 out of the 27 are in the list's top 100. So 25% of those in the top 100 previously served President Zuma as ministers (I was getting too depressed to count the deputy ministers as well). For me, that says it all. Of course, not everyone was Zuma supporters, but they were the (very tiny) minority. So this is where I just want to sigh and repeat the exasperated words of Marelize's mother. There was finally a flicker of hope in the country, a hope that things were going to change for the better. However, it is hard to keep the faith when so many of those who are meant to bring about change are the same ones who caused the problems in the first place.